Revenge is a dish best served cold.In Ann Aguirre's Mortal Danger, Edie Kramer has a score to settle with the beautiful people at Blackbriar Academy. Their cruelty drove her to the brink of despair, and four months ago, she couldn�t imagine being strong enough to face her senior year. But thanks to a Faustian compact with the enigmatic Kian, she has the power to make the bullies pay. She�s not supposed to think about Kian once the deal is done, but devastating pain burns behind his unearthly beauty, and he�s impossible to forget. In one short summer, her entire life changes and she sweeps through Blackbriar, prepped to take the beautiful people down from the inside. A whisper here, a look there, and suddenly . . . bad things are happening. It�s a head rush, seeing her tormentors get what they deserve, but things that seem too good to be true usually are, and soon, the pranks and payback turns from delicious to deadly. Edie is alone in a world teeming with secrets and fiends lurking in the shadows. In this murky morass of devil�s bargains, she isn�t sure who�or what�she can trust. Not even her own mind. 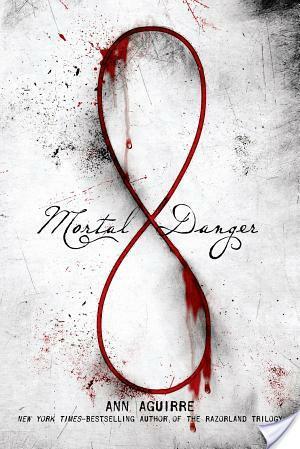 I feel like I have had nothing but good luck with the Ann Aguirre books that I’ve read.�Mortal Danger, Aguirre’s latest young adult book, is actually not a terrible read in my eyes. I have seen a few bloggers divided on the book — some seem to really hate it and some seem to really gel with it. My feelings lay somewhat in the middle of the road when it comes to this tale of Faustian bargains for revenge. I am not head over heels for�Mortal Danger but I am also not like BURN BURN BURN this book is terrible either. So, there’s that. Main character Edith “Edie” Kramer finds herself on a bridge, ready to jump off and end it all when this really, really excellent looking guy tells her that he’s willing to make a bargain with her. He will do her three favors in exchange for three favors down the line. Now, these favors are kind of like wishes. So, Evie ponders and is all like, yeah sure, I will take the deal. You see, she’s at the end of her rope after experiencing horrific bullying from her prep school peers. So, what Evie does is decides to dismantle the popular hegemony from the inside, and her first favor is for Kian, the guy who is performing favors for her, to make her beautiful. By beautiful, he just enhances her features so that she is the best looking version of herself. From there, Evie infiltrates and becomes friendly with some of her tormentors while also sowing discord. Meanwhile, the company that is in charge of granting Evie favors wants her to burn through them as quickly as possible, so they do some things to try and force Evie’s hand. The book,�Mortal Danger, goes to some pretty dark places. I honestly really gelled with Edie’s character on a lot of things. First off, she has this really low self confidence when she begins the book. She knows that she’s not exactly gorgeous and knows that becoming beautiful is more than taking off the glasses and the ponytail. Instead, it does take some work. Granted, we could spend days and days discussing the beauty myth, but by societal standards, Edie is not beautiful. However, she is very smart to the point of physics genius, which is awesome. She’s also a big science fiction and fantasy reader which is something that I totally relate to. I found her to be relatable in that I get how it is to be the reader girl who doesn’t quite have a ton of self confidence and who definitely went through an ugly stage. Trust, you guys my high school self was so embarrassing compared to my grown up self. So, yeah, I related to Edie quite a bit. What I like too, is that she has second thoughts about the revenge and about it going a bit too far. Sure, she wants them to pay, but not with their lives. I think that what she really wants is for them to have empathy, to understand what they did to her was wrong and what it feels like to be treated that way. Mortal Danger�by Ann Aguirre does have romance and kissing. Edie totally falls for Kian. I am not going to lie, I am not entirely sold on this romance. It’s nowhere near Deuce and Fade caliber. First off, it’s instalove, kind of. I mean, Edie is initially really, really attracted to Kian. She sees something in him that is similar to her. When you read through his backstory, you’ll see that instinct is correct. They kiss a couple times, but I don’t know, I just did not really see any kind of spark or heat or anything. Well, okay, so Kian does risk his life and make all these sacrifices for Edie, but we’re told that he does that, not really shown why. So, yeah, I just expected more from the romance angle and did not get that. As for the world building, I am on the fence with�Mortal Danger. I mean, it’s cool. Aguirre’s book is about immortals playing a game with mortals using favors and the mortals as pawns. The immortals are characters out of nightmares and folklore, this is also a cool element. However, it takes a long time to get to this cool element. I also would have liked it to be more fleshed out. She does not pull any punches and goes to some dark places with the book, which I enjoyed. Yet, ultimately, this is not my favorite Aguirre book by a longshot, however, I already know that I will be returning for the sequel. I really loved this book. I was really impressed with the nightmares and folk lore that was interwound in this world, even in the background and I expect that it will get even better with the next one. I do agree about the romance, but as I’m not really keen on a lot of romance in my stories that’s perfectly fine for me. Yes!!! These were my thoughts exactly!! Holy crap, seriously. You wrote your review way more concise and eloquently than me but I agree. Loved the idea, took a little bit too long to get to the cool parts of the plot. I really did enjoy Edie’s characterization but that romance was off. Sad face because I KNOW Ann Aguirre can write a romance! Maybe it’ll be better in the next one, fingers crossed.